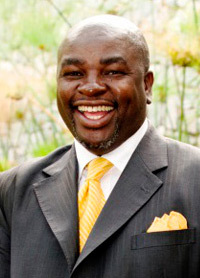 In May 2009, Billy Selekane was awarded the prestigious Communication and Leadership Award, which is given to a non Toastmaster who has excelled in communication and leadership. Billy is in esteemed company. Some previous award recipients were Archbishop Desmond Tutu, Justice Richard Goldstone, Clem Sunter, and Dr. Ali Bacher. Billy Selekane “the Township Boy” Selekane was the first South African speaker to speak at a General Assembly of the National Speakers’ Association convention in the USA. He is Group CEO of a Motivational, Personal and Organisational Effectiveness Organisation and is a dynamic entrepreneur who has carved himself a niche in the consulting and training industry by coming up with dynamic, innovative and cutting edge systems that have enjoyed great success throughout SA. He is a well-known and respected speaker in leadership, Strategy and Personal Effectiveness. He holds an International Management Diploma, certificates in Strategic Planning, Conflict Management, Leadership Development, Change Management, Process Re-engineering and Personal Assessment and Mentorship. He is President of the National Speakers Association of South Africa (2006-2007), a Life Member of XL Foundation (a Singapore based organisation with a special focus on entrepreneurship and social upliftment), a member of the International Facilitators Association and has acquired extensive leadership knowledge in his work as a Motivational Speaker, facilitator, Strategic Planner and Business Consultant. He has worked in Botswana, Kenya, USA, UK, Sweden, Asia and Holland for fortune 500 companies such as Pam Golding Properties, Swedish Institute of Public Administration, Maps UK, Nike South Africa, ADT Security, International Youth Fund, Nokia , Development Bank of South Africa, 3m Sub-Sahara Africa, Roche Pharmaceuticals to name but a few. He is a regular at a Gauteng based radio station Kaya FM with a listener ship of +900 000 daily where he inspires and give advice on Personal, Leadership and Team Effectiveness issues and features as a regular Motivational/Inspirational Speaker on SABC 3’s The World Today programme with a viewer ship of over 1 000 000. He has inspired over 3 million people globally through his keynotes, seminars, interventions and he recently published his debut book, “From Barefoot to Snakeskin Shoes”. Billy Selekane believes that motivating your target audience is not enough, you should inspire them to change their belief systems and act upon decisions they make through a transformational process rather than an information sharing session.